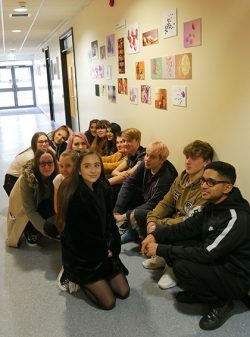 Photography students at The Sixth Form College, Solihull have just completed a live brief for a real client this term and will soon see their photography used in a real online advertising campaign. A level Photography students were given four weeks to produce a series of photographs for Mr Simms Olde Sweet Shoppe in Solihull. They had help from professional commercial photographer, Steve Carse, who visited the College several times to work with the students in the studio and in the editing suites. He provided not only inspiration, but also advised them on the skills needed for this genre of photography. Steve Carse and Mr Simms Solihull’s Assistant Manager Kelly Plant visited the College this week to see the final images and judge a winner. They chose a set of retro photographs by student Esther Cawood (aged 16 from Leamington Spa) as the best shots. Esther matched dolly mixtures and sherbet flying saucers with retro items like a cassette tape, ticket stubs, candles and pastel colours in her interpretation. Other students made use of light and shadow, perspective and size in their creative interpretations. The photographs will be used to advertise the products of Mr Simms Olde Sweet Shoppe in Solihull on their Facebook page.